Finding a pattern for an Alice in Wonderland costume can be a challenge at times. However, thanks to the recent Tim Burton film based on this classic children's book, patterns are once again readily available. While you won't find patterns for every character from Wonderland, Alice, the Red Queen, the Mad Hatter and the White Rabbit are all available. Unfortunately though, there don't appear to be any boys' patterns available for Alice's supporting characters at this time. Take a look at the following patterns and see if you can find at least one that suits your needs. You'll find a little bit of choice in children's size patterns. The following patterns are available online at the Simplicity website, and they sell for approximately $10.00. Simplicity 2330 is a pattern for Alice's blue dress and pinafore. 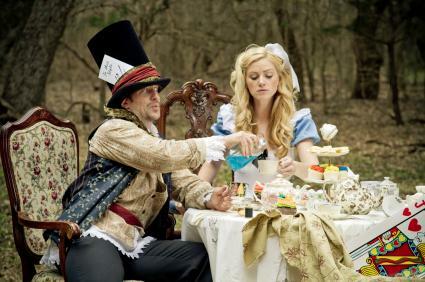 The pattern can also be adjusted to create a girl's version costume of the Mad Hatter or the White Rabbit. Sizes range from 3 through 8. Simplicity 2969 can be used to create another version of the Mad Hatter costume for a girl. Simplicity 8234 will make an adult Alice's dress and neckband, suitable for cosplay. Select HH for misses' sizes 6, 8, 10 and 12, or choose R5 for misses' sizes 14, 16, 18, 20 and 22. This pattern is also available at the company website as sells for about $14.00. Simplicity 8237 features ladies' patterns for the Mad Hatter and the White Rabbit, and includes the main dress as well as a bow tie for the Hatter and a neck ruffle for the Rabbit. Sizing is the same as for the Alice dress, and you can pick up both patterns for under $14.00. Simplicity 2333 is for the Mad Hatter's costume, and it's largely based on the costume Johnny Depp wore in the Tim Burton film. Choose AA for men's sizes XS, S and M, or choose BB for sizes L and XL.You can purchase the pattern online for approximately $10.00. McCall's 4948 is a very versatile pattern. It's listed as the Queen of Hearts and will certainly work for the Red Queen's costume, but I can also be used to make Alice's dress. You can choose the pattern in sizes 3 through 8 for girls or sizes S, M, L and XL for ladies. The pattern retails for approximately $16.00 at Pattern Review.com. Finding a blonde wig and black shoes to go with an Alice costume shouldn't be too difficult. Mary Jane-style shoes can be found in many shoe stores and discount shops, especially around Halloween. Alternatively, you can purchase a pair of black ballerina flats and attach a length of black ribbon or wide black elastic to the shoe across the top of your instep so it looks like a Mary Jane style shoe. The blonde wig can easily be purchased through online costume shops or locally at large retail stores during Halloween. You can also check out Party City for wigs and other accessories for Alice and other Wonderland characters. 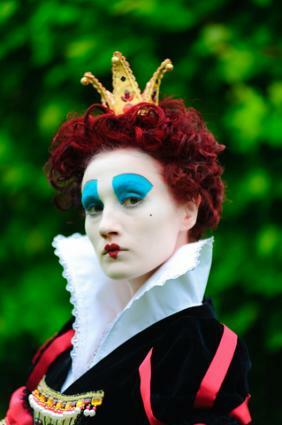 Making an Alice in Wonderland costume doesn't have to be an expensive proposition, or even a difficult one. You should be able to purchase any of the patterns mentioned here at any local store that carries Simplicity and McCall's patterns. If you have difficulty finding the pattern you want and you don't want to purchase it online, any pattern for Dorothy's dress from the Wizard of Oz can be converted into Alice's dress simply by choosing the appropriate fabric. So, there's no reason you can't make your vision of Wonderland come true.